​When adding extra panels to my custom cabinets it’s okay to do so because I will still trim some of the sides to make room. Next is actually seeing how far each style will be in between each style of the custom cabinets. For my example the curve of these custom cabinets is 2 feet deep and 2 feet wide. So what I have to do is a little bit of mathematics. I have to figure out the circumference. I use a formula for this and it’s pie times diameter equals circumference. And the diameter is 48 inches 2 feet and pie which is 3.14. so 3.14 times 48 which equals 150.72 and then we are going to divide that by 4. Then we get 37.68. We are going to call that 37 and 5/8 to make it simpler for the units we use while measuring. And that’s how long it is from the start of the corner or curve to the other side. 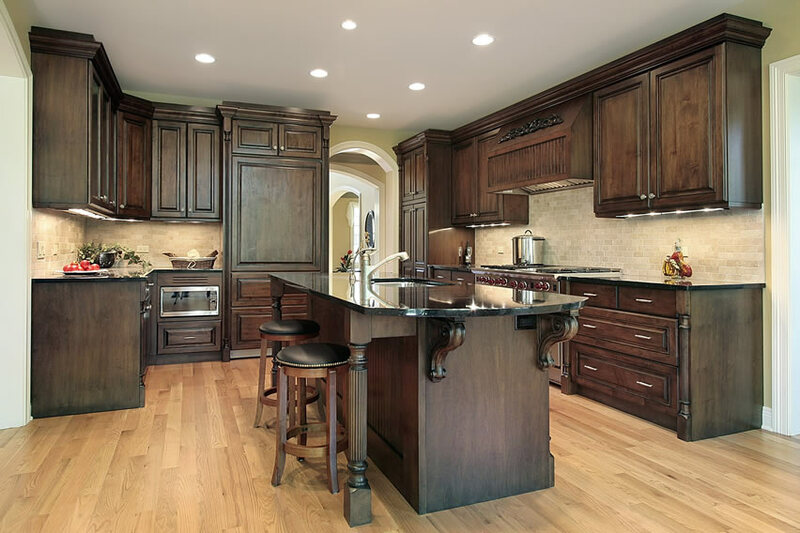 Mathematics is a very essential part of the construction of your kitchen custom cabinets and can definitely make or break your project so it's beyond important to not make any mistakes while figuring your measurements. Each style is 3 and a half inches long so you subtract 3 and a half for each style which there is five style so that is sixteen in a half inches. Subtract that from 37 and 5/8 and that leaves me with 21 inches to work with. So That leaves me with a six inch panel which looks good for this example of custom cabinets. Next is when I start cutting the angles to carry on my custom cabinets. This give the area space to store dishes and pans. The island is another place where you can store as well as give it a seating area for two.